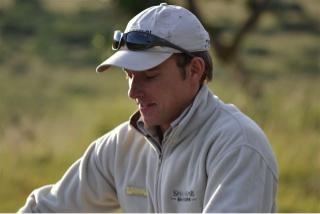 People say that when they go on safari it’s the Ranger that makes the experience exceptional. 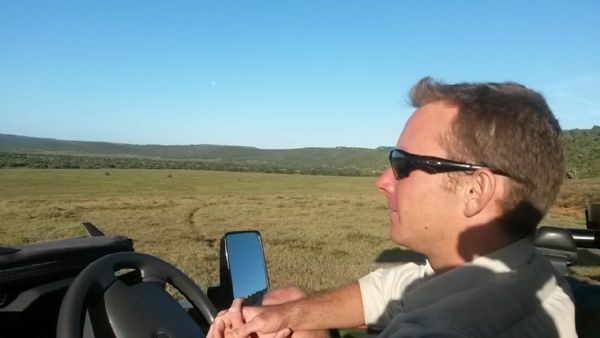 When I arrived at the exquisite 5 star flagship of Shamwari Game Reserve, Eagles Crag Lodge, to be taken on an afternoon drive with Jan, I had the pleasure of meeting the guests who had been with him for the previous 3 days and they said exactly that. In fact, they even gave me their nickname for him, which at the end of my drive I fully understood it’s foundations – Jan is the Shamwari Energiser Bunny. Rather fitting that one of the rangers operating out of this location, famous for it’s celebrity guests returning year after year, has a celebrity nickname of his very own. With his new guests and myself on board, all British, he took the time to go through the safety briefing with a hint of humour and had already learned all his guest’s names – impressive! The bond and rapport with his guests was immediate and with that their ability to relax into the drive and enjoy their first sightings of the reserve was instant. The drive out of Eagles Crag is vastly different to that of the rest of the lodges, with a short climb to either head north or south, you are immediately presented with some of the most stunning scenery on the reserve. You can almost hear the intake of breath from the guests, which Jan feels and expands on with his immense knowledge and sensitivity to the environment around him. He spotted a white rhino and her calf in deep thickets within minutes of leaving and we watched these magnificent animals go about their normal daily lives for a good 20 minutes. Jan was very conscious of creating the perfect photo opportunity, bearing in mind we had a very keen photographer with a lens the size of a small country with us! Jan’s ability to read the situation and predict the path the rhino were going to take was notable and as a result all of the guests got a beautiful headshot of mum and baby with the sun behind the lens, accentuating the armour like quality of these creatures and enhancing the scene beautifully. It was clear he was somewhat of a perfectionist! Onward through the upper grasslands before working our way into the valley bushveld coming out into the open grasslands in the southern part of the reserve, where we found aggregations of animals aplenty. Questions were firing from the guests at the majestic sight surrounding them, all of which were answered with fascinating clarity. Even with veteran safari experts with him it was clear that Jan was imparting valuable and interesting facts to further expand their understanding of a game reserve and it’s inhabitants. With news coming in over the radio of other sightings in our vicinity Jan recognised his opportunity to make a dream come true for one of the guests who mentioned their love of the elephants. A herd were seen crossing open grassland in the direction of the Bushman’s River, so he positioned us in the perfect spot to watch these majestic animals make their way from bush to water. There are few words to describe the enormity of emotion evoked in me when seeing the elephants, yet Jan who must see these animals on a regular basis, is still deeply moved by what he sees. This, I believe, demonstrates a deep rooted passion and appreciation of nature in its entirety. His charisma is captivating and his charm incalculable – if you thought you loved the animals before you got to Shamwari then you will just love them more having spent time with Jan.
As the sun began its journey closer to the horizon we turned back and set off to a vantage point for a sundowner. With immaculate timing we stopped in a secluded area which felt like our very own private reserve and tucked into some outrageously good nibbles and some excellent wine, watching a flame-like sunset lick the horizon. With guests regaling various safari stories Jan played host with consummate ease. I was surrounded by abundant laughter and evidence of utter relaxation, all in the space of a few hours. This takes great skill, not only the ability to listen, but to empathise and appreciate others around you. Jan said that the thing he loves the most about his job is meeting new people every day and I can certainly say that this is plain to see. The warmth he emits and the desire to learn about the people he looks after is substantial, making everyone feel important and ultimately comfortable. With the cold wind beginning to bite and the warmth of the sun gone, it was time to go back to the Lodge for a hot chocolate and reflection on the first drive. It must be hard as a Ranger to get the balance right of what you see and when, after all, the animals are not standing on a spot waiting for people to come and witness their presence. It was clear by the guest’s reactions that they felt their first drive was a great introduction to the reserve and met their expectations with ease. They had plenty to talk about and just as much to look forward to. If anything I was disappointed that I wasn’t going to be with them for the morning drive, not only to be out on the reserve with them as a group but mainly to miss out on Jan’s humour, magnetism and knowledge. There are many characters within the Ranger team at this Eastern Cape paradise, Jan is definitely one of the most prominent. Always professional, alert and dedicated to ensuring his guests experience is the best it can possibly be. His comical nickname is accurate, fuelled by his love of Shamwari, people and animals, he gives his all to his guests and they appear to feed off his energy and passion. A truly special afternoon was had by each and every one of us, beautifully held together and managed by a very talented Ranger. The anticipation for the following morning was tangible and being left wanting more can only be a good thing. This must be the only holiday where we are all pleased to be up and out of bed at 4am in the morning! Roll on sunrise when the Energiser Bunny is released once more.